A mysterious event from Earth's past threatens to ignite a war so big that the Transformers alone will not be able to save the planet. 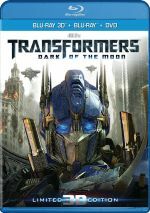 Transformers: Dark of the Moon appears in an aspect ratio of approximately 2.35:1 on this Blu-ray Disc. The transfer of Dark appeared virtually identical to those of the first two – so much so that I entered “cut and paste town”, so please enjoy these duplicated comments from an earlier review! Like most other Michael Bay flicks, Dark favored stylized colors – all two of them! Teal and orange heavily dominated, and that could make the hues look goofy at times; the image favored so much orange that actors occasionally resembled Oompa-Loompas. Still, I can’t fault the transfer for Bay’s excesses, so this was an accurate representation of the source. I felt even more pleased with the movie’s impressive Dolby TrueHD 7.1 soundtrack. A movie packed with mayhem and action, the mix used all the channels in a lively, involving manner. Vehicles, weapon-fire, robots and similar elements popped up from all around the room and delivered a smooth, engrossing soundscape. This package includes both 2D and 3D versions of the film. The comments above reflect the 2D edition – how does the 3D compare? In terms of visuals, both seem very similar. I think the 3D looks as good as the 2D, with comparable accuracy, colors and the like. Dark gets a boost from the quality of its stereo imaging, as the movie shows terrific depth. Fans of “pop-out” moments may encounter disappointment, as the film doesn’t emphasize those. However, it compensates with a genuinely interactive and involving sense of dimensionality. The movie consistently boasts excellent integration, as the movie seems deep and full. All of this adds up to a top-notch 3D presentation that makes the film more enjoyable. Above and Beyond: Exploring Dark of the Moon provides a five-part documentary that goes for one hour, 50 minutes, 46 seconds and includes notes from director Michael Bay, producers Lorenzo di Bonaventura and Ian Bryce, editor Roger Barton, screenwriter Ehren Kruger, visual effects supervisors Matthew Butler and Scott Farrar, supervising art director Richard Johnson, art director Ben Procter, picture car coordinator David Urich, transportation coordinator Randy Peters, 2nd unit director Kenny Bates, transportation captain Joey Freitas, special effects supervisor John Frazier, special effects coordinator James Schwalm, additional 1st AD KC Hodenfeld, production designer Nigel Phelps, military advisor Harry Humphries, construction coordinator Jonas Kirk, location manager Jonathan Hook, location manager Ilt Jones, set decorator Jennifer Williams, assistant location manager Leann Emmert, unit producer manager Allegra Clegg, stunt skydiver JT Holmes, wingsuit cinematography Rob Bruce, editors William Goldenberg, Roger Barton and Joel Negron, model and texture supervisor Dave Fogler, digital effects supervisor David Hodgins, compositing supervisor Lou Pecora, associate animation supervisor Rick O’Connor, visual effects producer Wayne Billheimer, animation director David Andrews, associate visual effects supervisor Jeff White, animation director Scott Benza, supervising dialogue/ADR director Mike Hopkins, supervising sound editors Ethan Van der Ryn and Erik Aadahl, re-recording mixer Greg P. Russell, and actors Tyrese Gibson, Rosie Huntington-Whitely, Shia LaBeouf, Josh Duhamel, Julie White, Patrick Dempsey, Alan Tudyk, John Malkovich, and Kevin Dunn. Next comes the 26-minute, 15-second Uncharted Territory, a program with Bay, NASA former Chief of Public Information Jack King, NASA Headquarters Office of Communications Bert Ulrich and Robert Jacobs, NASA Kennedy Space Center Office of Communications Lisa Malone, and Pad Leader VAB Bob Williams. “Territory” looks at the current status of NASA, with an emphasis on the Space Shuttle. It becomes a fairly efficient overview. 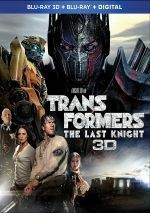 With 2011’s Dark of the Moon, the Transformers franchise continues with a film that offers a virtual carbon copy of its predecessors. The movie occasionally musters decent action but seems too silly and disjointed to succeed. 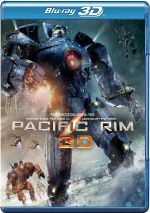 The Blu-ray delivers excellent picture and audio along with a strong set of supplements. This isn’t a good movie, but it looks and sounds great, and the 3D version adds pep.